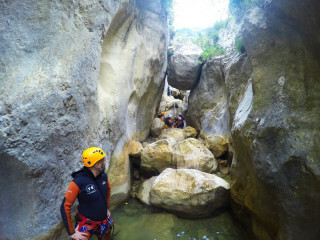 Our canyoning tour is available every day all year round. The tour is most suitable for children 10+ and 8+ if confident. All visitors are welcome regardless of any previous experience. 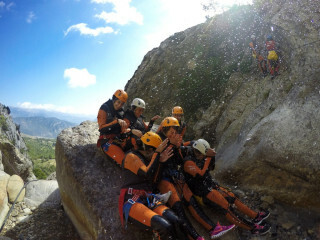 However, good physical fitness is required as this is a highly rewarding but slightly advanced canyoning adventure. This tour is public and limited to 8 people. We start at 9 a.m. by picking you up in the hotel and end around 6 pm, returning you to the same place. 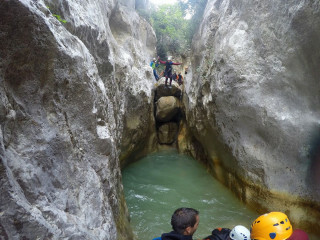 The canyoning itself usually takes 3-4 hours. What to bring? Along with your “dry” shoes for the drive, please take a pair of stable, closed sports shoes, which are suitable for walking in water. Flip-flops and sandals will not work for this tour. 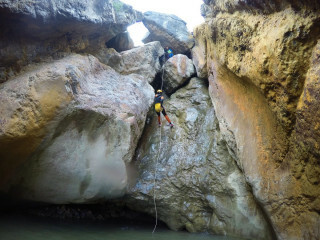 Also bring your swimsuit to wear under the wetsuit and a towel, which will come in handy when you return to the car. We also recommend bringing some snacks for the drive. Lunch is not included in the price, but we will have a 2-hour stop in a nice local village after the activity, so you can eat there or bring your own food. Your booking will become valid after we receive your payment. You can cancel up to one day in advance with 100% reimbursement. For later cancellations there is no reimbursment. 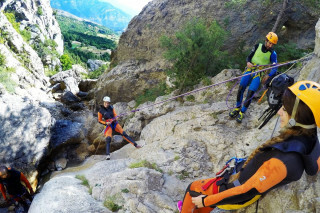 Simply put, the unique rock formations of the Pyrenees region make it one of the best spots in the world for canyoning. Let your inner-explorer emerge as you glide down streams and waterfalls, cross challenging passes, and jump into pools of fresh water. 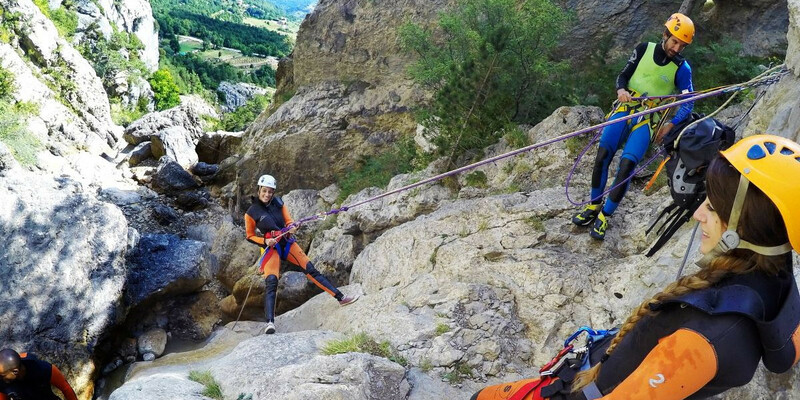 Never been canyoning before? 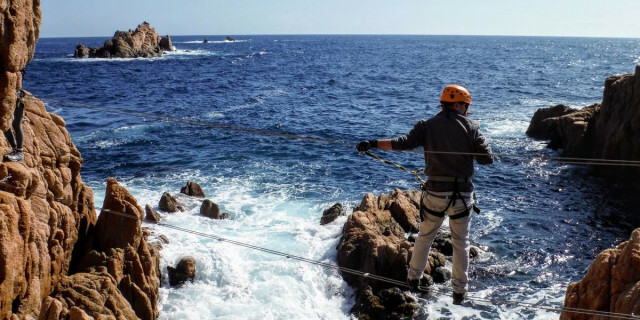 Don’t worry - with our expert guides and quality equipment you’re in safe hands. 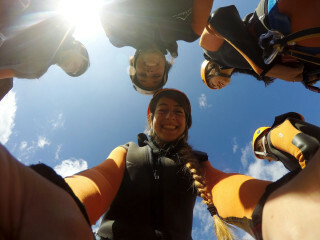 We provide the wetsuits and helmets; all you need is to be physically fit and ready for a thrill. 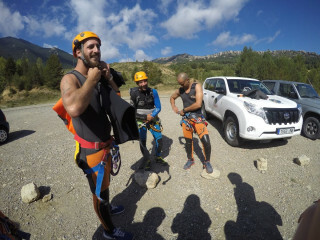 We pick you up at 9 a.m. at your hotel and drive you in a comfortable van straight to the Pyrenees Mountains. Here we begin with a light meal to get energized. Once we set all the equipment at the foot of the canyon. We take a short climb to the jumping-off point. From there it’s just down, down, down. 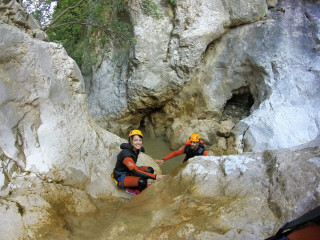 Depending on the conditions in the mountains, we pick one of the two best canyoning locations. 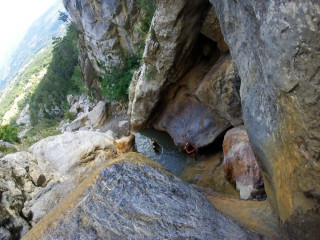 We glide, climb, rappel, and jump from rocks into pools. The riverbeds have an almost mystical beauty, with dozens of waterfalls in a row and crystal clear pools. 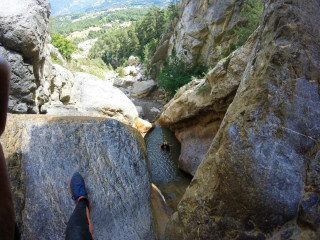 You’ll want to marvel at your surroundings, just watch where you jump! Finally, we get to the foot of the canyon just in time to enjoy a tasty meal in a local village. After about two relaxing hours, we head back to Barcelona and return you to your hotel around 6 p.m. 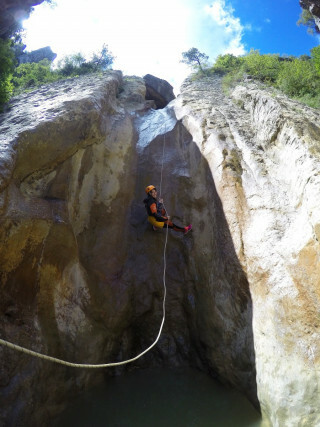 This one-day canyoning experience in the Pyrenees is perfect for all those looking for a dynamic expedition in a stunning natural setting. We promise your heart will be pumping and your smile will last all day.